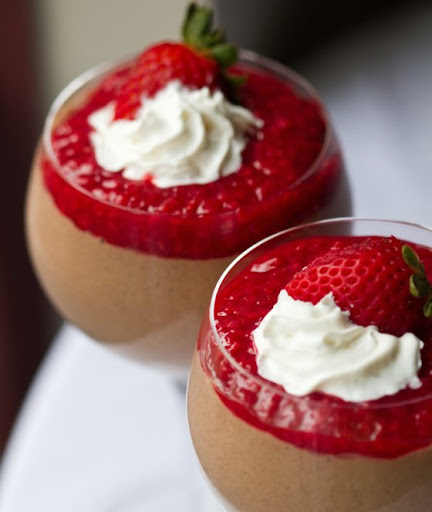 Homemade Berry Jam and Silk Chocolate Mousse. Have you ever made homemade jam? Take it from this jam newbie - it's terribly easy and the results will impress you - and your family. Better than the bottled suff you buy in stores. Way better. I played around in my kitchen last weekend and whipped up my very first batch of jam. And a slew of delicious jam-infused creations followed. Like jam-swirled bagel spread and berry-accented chocolate mousse. I was amazed at how easy the process was and how delicious the results are. I don't think I ever want to buy bottled jam again!.. Also in this post.. 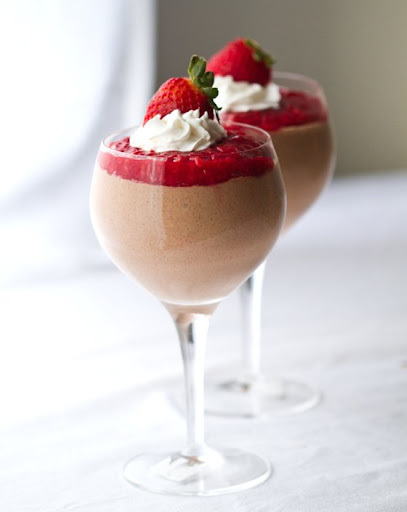 Silk Chocolate Mousse. Two Ingredients. 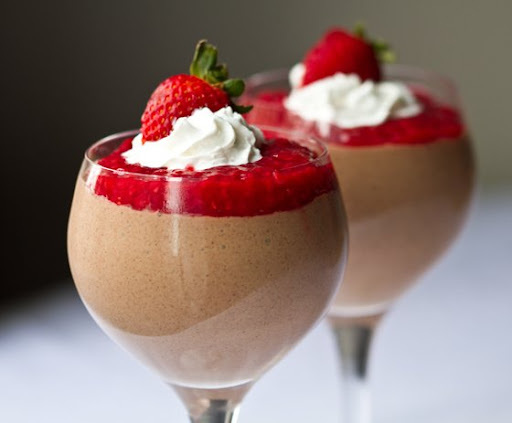 This silk chocolate mousse is awesome. It's a simple recipe. Together: Jam and Mousse, soy whip on top. Recipes ahead!.. I started off with a Double Berry Jam (shown dolloped on top of the mousse in the image) - it features sweet tart raspberries and juicy strawberries. Then yesterday I made a Strawberry Citrus Jam. This stuff is so yummy that all I need to enjoy it is a spoon! Or slather some on a warm slice of toast and instant jam heaven. ..Now I need to find some jam jars. I am dying to turn my kitchen into a mini jam factory. Bottle my whimsical creations and head out to a Farmer's Market to sell them. None of this "Strawberry Jam" simplicity. Lets try Blackberry Ginger Jam, or Blueberry Cayenne, Cinnamon Maple Marmelade, Peach Papaya, Spicy Grape. I'm inspired. Anyone else a jam-making fanatic? Jam Junkie? And tips to share? 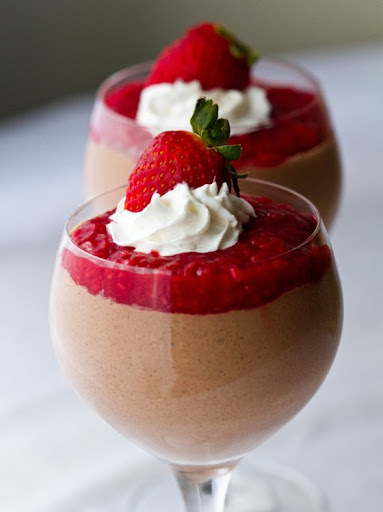 Berries and Cream. Yesterday for breakfast I whipped up some Berry Cream Cheese using my homemade Double Berry Jam. Wow was this stuff awesome! Sometimes I complain that tofu cream cheese is a bit lacking in flavor and texture. Well whip in a few spoonfuls of homemade jam and problem solved. 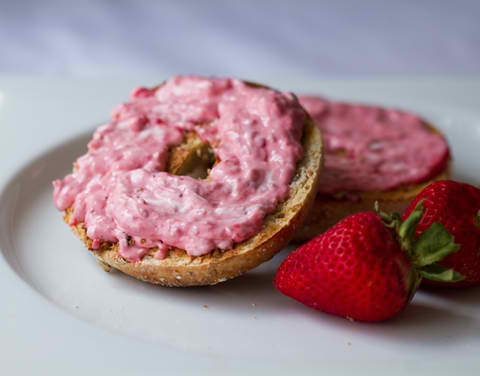 Get my Sweet Pink Bagel recipe here. Isn't it pink-tastic?.. 1. For both jams - dissolve the corn starch in the cold citrus liquid. Then combine all ingredients in a large pot on stove. Bring to a boil. 2. Reduce heat and allow to simmer for 30-60 minutes. 3. Pour into jar(s) and store in the fridge. 1. In a double broiler, add chocolate chips and oil. Heat until melted. Remove from heat. 2. 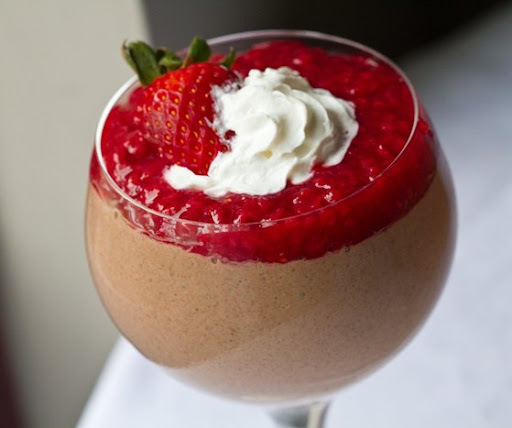 Add your tofu, optional sweetener, and melted chocolate to a blender. Blend until smooth and silky. 3. Pour into serving dishes and chill in the fridge for a few hours - until firmed up a bit. 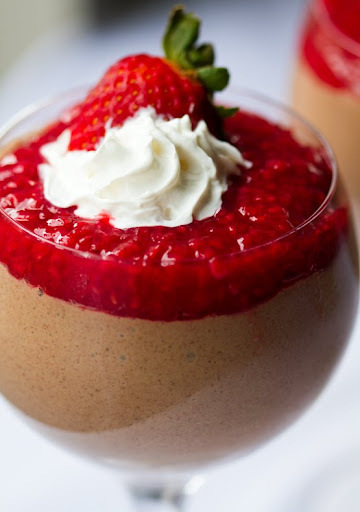 Mousse Tips: You can use arrowroot and or agar agar to make your mousse even more firm - but I personally like the silky texture. You can also add more chocolate chips for a deeper chocolate flavor and richer texture as well.